We lived in Western New York back in the 70’s, and I recall my two older brothers building a fort deep into the snow. The exit was tricky seeing it turned into an icy slide after using it. It was probably not that steep looking back on it, but it sure felt like it wearing my bulky winter gear. What is your earliest memory of snow? Thanks for sharing Sheila! 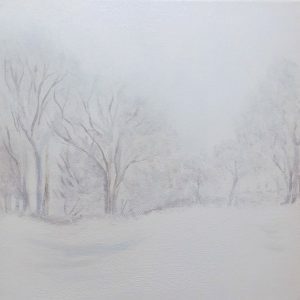 I love painting memories from winter and how it did not keep us from venturing out as well. I’m curious where your above story took place. Thanks for the memories. It was a bad blizzard. So bad it inspired one of our favorite board games.. “The Blizzard of ’77” I going to check Amazon to find one for our son and family visitors to enjoy this holiday.